(Nanowerk News) Oxidants found within living organisms are byproducts of metabolism and are essential to wound-healing and immunity. However, when their concentrations become too high, inflammation and tissue damage can occur. University of Illinois engineers have developed and tested a new drug-delivery system that senses high oxidant levels and responds by administering just the right amount of antioxidant to restore this delicate balance. The findings are published in the journal Small ("Stimulus-Responsive Anti-Oxidizing Drug Crystals and their Ecological Implication"). Many pharmaceuticals include specialized polymers and particles that control the timing or concentration of the drug released once administered, the researchers said. However, these additives can hamper crystallization during the manufacturing phase of some drugs - like antioxidants - causing them to dissolve in the body in an uncontrolled manner. "We saw an opportunity here to develop a different kind of drug-delivery system that could sense the level of oxidant in a system and respond by administering antioxidant as needed," said chemical and biomolecular engineering professor and study co-author Hyunjoon Kong. Kong and his team found a way to assemble crystals of catechin - the bright green antioxidant found in green tea - using a polymer that can sense when oxidant concentrations become too high. The researchers tested the responsiveness of the resulting catechin crystal-containing polymer in the common freshwater planktonic crustacean Daphnia magna, the water flea. "Heart rate is an indication of the extent to which potentially toxic chemicals influence physiology in water fleas," Kong said. "Daphnids are often used to monitor environmental impacts on ecological systems, and because their hearts are similar to those of vertebrates, they are also used to evaluate the efficacy of cardioprotective drugs." The researchers exposed the daphnids to water contaminated with sublethal concentrations of the natural oxidant hydrogen peroxide while monitoring their heart rate. They found that the daphnids' mean heart rates dropped from 348 to 290 and 277 beats per minute, depending on the concentration of hydrogen peroxide used. Beyond the potential pharmaceutical uses for the new polymer, Kong's group is looking into its use for curtailing the impact of highly oxidizing chemicals in natural waterways. "Hydrogen peroxide is often used to clean water fouled by excessive algae, and this raises concern about how the oxidant may be affecting living organisms in water," he said. 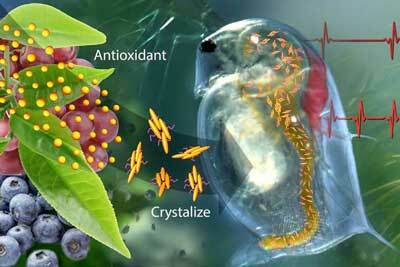 "We think this new antioxidant-delivery system could be used to address the problem of over-oxidized natural waters." The researchers plan to push ahead with developing the polymer for pharmaceutical and environmental uses. "This study proved a concept, but we have more work to do," Kong said. "There is concern over the safety of the specific polymer we used - polyethylenimine diselenide - but we are getting close to finding a viable replacement."